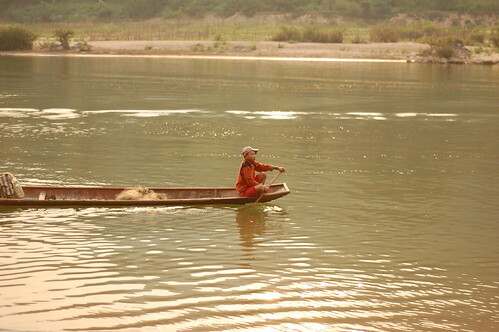 If you were asked to stay at a river village where they had no electricity, roads or banks and is only accessible through slow boat, would you go? This was the decision I faced when Hutch asked me to take a trip to Mouang Ngoi, in Northern Laos after our little Bus Ride from Hell episode. He had been there a few years back and he found the place rustic and isolated from the world. He was eager to know if things remained that way. 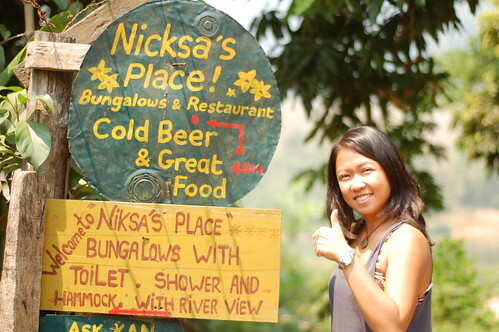 We stayed at Nicksa's place for 25,000 LAK (3.25 USD)/ night for 2 people. We had a bungalow to ourselves with 2 beds, a hammock overlooking the river and a fantastic view of the sunset. Never mind that we had to share a toilet outside and had no hot water. Just the view more than made up for that. 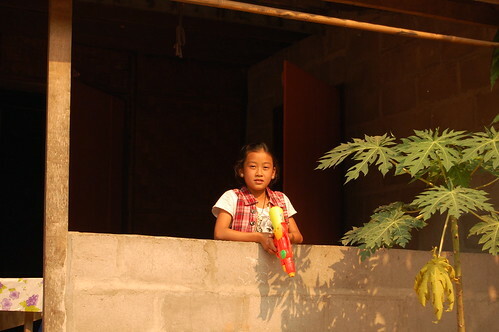 The place is run by a Laotian family with 5 kids and we stayed there longer than we should. Have I mentioned the sunset? You can sit on the hammock while watching the sun sink slowly behind the limestone karsts. I never got tired of this scene. I waited for this moment every single day we stayed in Mouang Ngoi. If you're a Piscean like we are, you tend to go crazy every time you get close to body of water. So everyday we swam in the Nam Ou River. The water was not nearly as cold as Halong Bay. But it cooled us down in the afternoon when the day got scorching hot. It was also soothing to see the village life pass by. Tourists and locals alike would happily wave from the slow boats. 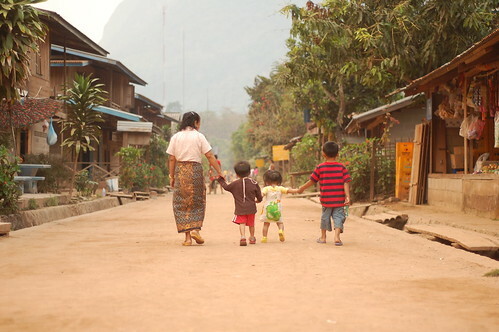 This town is one of the poorest we have ever seen in our Southeast Asian jaunt. But everywhere we walked, we were greeted by smiles and waves. These people had very little and probably have never left their town, but they were happy and content. One of the best discoveries we had was the 15,000 LAK (2 USD) buffets at Bouphant Restaurant. All the tourists would flock here for breakfast and dinner. 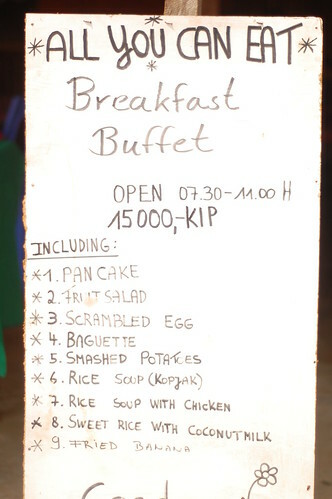 For breakfast, the family that ran the place would serve a great selection of fruits, pancakes, sticky rice with banana, bread and omelet. It got even better for dinner. 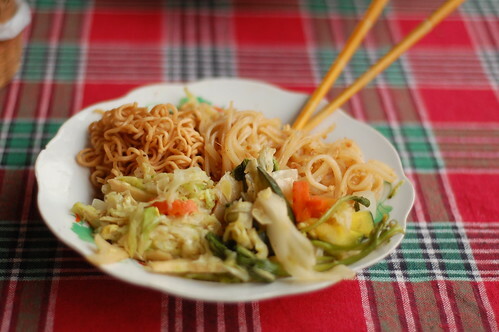 They served all sorts of noodles, mixed vegetables, a creamy squash dish, rice, beans and summer salad. Of course, it couldn't beat the variety of Vietnamese dishes we had previously enjoyed. But it was good and it was cheap. The only downside was that they served the same dishes everyday. It was perfect for a few days but we eventually had to seek out other options. One thing that I absolutely loved about this place was how time just stood still. Everyone went about their day slowly and deliberately with so much joy. Even the most ordinary task of bathing in the river became a sacred ritual. It was such a contrast from the modernity of life in Hanoi or Ho Chi Minh, Vietnam. Hutch eventually realized that many things have changed in this sleepy little town. More houses were being built with concrete and steel instead of the usual wooden houses on stilts. They finally had a few hours of electricity at night which brought about loud karaoke music, internet access and satellite TV. More barangs (foreigners) arrive everyday. But the serenity of the place remains the same. The people who remain here live simple and contented lives. 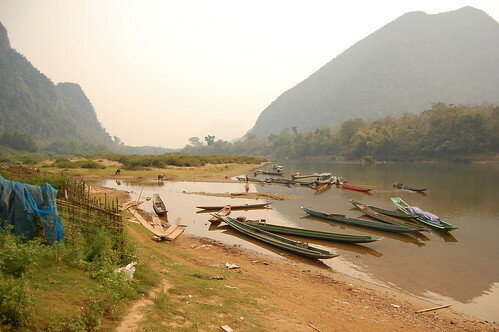 Mouang Ngoi is only accessible by boat from Mouang Kwa or from Luang Prabang. On the next Laos post, see what Sole Sister Chichi has been up to while waiting in the lovely, bustling town of Luang Prabang. Have you ever been to an unexpected place where you got stuck? What kept you there? Share your experience by leaving a comment below. Wow, this place looks really wonderful! It seems easy to forget you're leaving when you're in this town! Wasn't it hard to move on when you had to? whew! i can live here for a month. lovely place indeed! It was really difficult to leave Aleah. But Chichi has already been waiting for a week in Luang Prabang. I definitely have to go back. Please make it out there if you're ever in Laos..
Oh yes Claire, there have been several places in Asia where we have been stuck and didn't mind it so much. Most recently, it's been Chiang Mai, Thailand. Thanks for sharing your experience. Storms can sometimes lead us to the most wonderful places! I was thinking of you Flip when I came to this place. It's something you and James would most probably enjoy. Very quiet and serene. I wish we had more time here. I also ate at the buffet in LP but I didn't like the part where you can only get food once. And the food wasn't always so good. But pretty cheap I must say! You have to include it in your itinerary! 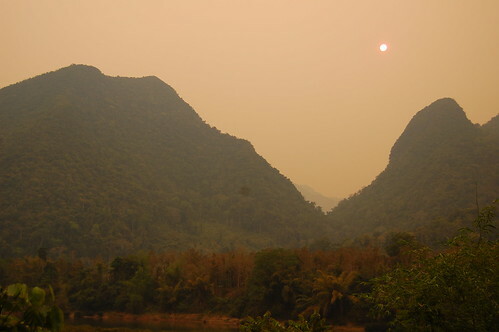 I can say this place is perhaps the best place I've been in Laos..
Oh yes James! A week was too short to be stuck actually. I have to come back here. Glad you liked it because I thought you would.. I'm starting to miss the $2 buffet already now that you reminded me of it. For sure there will be another shortage of pancakes. Indeed Muang Ngoi has changed but the core of its drawing power is still intact. The people are still as friendly as ever. There's not so much trace of the outside world. The river is still clean and green. Though I think they should have better ways of disposing their rubbish. I hope it stays that way. Glad you feel the same way Mich! And I like the word refuge. It was nice to go there before the craziness that is called Partying and Tubing in Vang Vieng. Yes, we had the same idea Ed! We only ate twice a day to save money. Late breakfast and early dinner. Winner! Lovely place! It's as if it's taken from a history book. That would be interesting to visit, just to let the time pass by. I've only been stuck once, in Coco Beach in Puerto Galera because of a storm. It was all good though, because we got the extra night for free and the buffet breakfast was something to look forward to! Yeah, that's exactly how I felt Ms. Bratpacker ;-) I can just spend the entire day on the hammock. But we did do some trekking for a few days. Writing about that next. Thanks for sharing your experience. You never know what great unexpected places you'll end up in unless you're open. And yeah, buffets are the best when traveling! you found an unexpected gem. Oh yes, I can say it's my Piscean side that draws me to the water. Glad we have the same sign Ayan! We really have to put Central and South America on our next big trip Steve. I can imagine how you can get 'stuck' in such a beautiful country. And sometimes it's not so much the place but the people who get you stuck there in the first place. I hope we find more of this unexpected gems in future adventures! wow, a very interesting place to go to! I loved Mouang Ngoi. What a great little village! Inexpensive, quiet, friendly and amazing views from your room. You should make it out there Lovely! So worth the sloooow boat ride. Oh yes it is Odie! Hope you go there someday! Wow, what can I say, GREAT photos. Was the light in the place really like that? AMAZING! That's what we did Kat! Such a pretty relaxing place to laze the day away. Thanks Nikka! I was so inspired to go around taking photos with my 50mm lens that day. And yes, the light was really like that. No edits necessary. It's funny how you mentioned light because light truly is different in many parts of the world. I had to travel extensively to realize that. This seems to be such an interesting place.